"We couldn't have asked for a better building experience." That testimonial is just one of many glowing comments about C.L. Smith Construction. Most builders promise great homes and many deliver on that promise but few of them actually become friends with their clients. Cameron L. Smith, president of C.L. 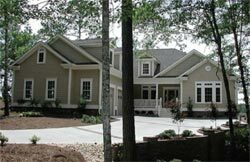 Smith Construction in Southport, North Carolina has made it his mission to incorporate his experience, attention to detail and dedication to clients to become one of the most sought-after builders in the area. Over the past ten years, his company has built a solid reputation based on customer satisfaction. In fact, C.L. Smith Construction doesn't consider the job done until the client is completely satisfied with their new home. By upholding the highest standards, C.L. Smith Construction has a productive relationship with designers, suppliers and sub-contractors. The entire team is highly involved and takes pride in their services, materials and the final product. When a client can't be in town for the entire building process, C.L. Smith Construction is there for assistance from day one of the planning phase through to completion. It is extremely important for clients to be involved and kept well-informed with every step. 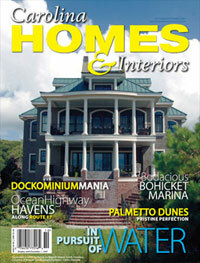 Whether building a large estate home or a retirement home for two, the company offers a variety of home plans. C.L. Smith Construction follows a three step pre-building process that is an A.R.B. (Architectural Review Board) approved plan that suits homeowners' needs as well as the home site and the budget. Guidance for clients is key and one that is established at the initial meeting. Smith helps determine the best site for your home, taking trees, sun orientation, lot shape and width, garage access and terrain features into consideration. Next, clients must select a home plan or arrange a meeting with a local architect. In addition, cost suggestions may be made with the preliminary design that will help keep clients within their budget. Finally, before construction can begin, the house plan and material selections must be presented to the A.RB. for approval. As the plan is finalized, issues such as type of brick or siding, paint colors, windows, roofing and other exterior requirements will be selected. Once all of these phases are completed, construction of the new home begins. It is through these details and communication between builder and client that C.L. Smith Construction has built its name. Their homes can be found in Southport and surrounding communities such as Winding River Plantation, St. James Plantation, The Landing, Harbor Oaks and Arbor Creek.